Alexandra Bee Blog: Whirlwind Weekend! Happy Monday!! Whew, what a whirlwind weekend I had! Friday night UVA had Relay for Life. Alpha Phi raised over $7700 for the American Cancer Society! 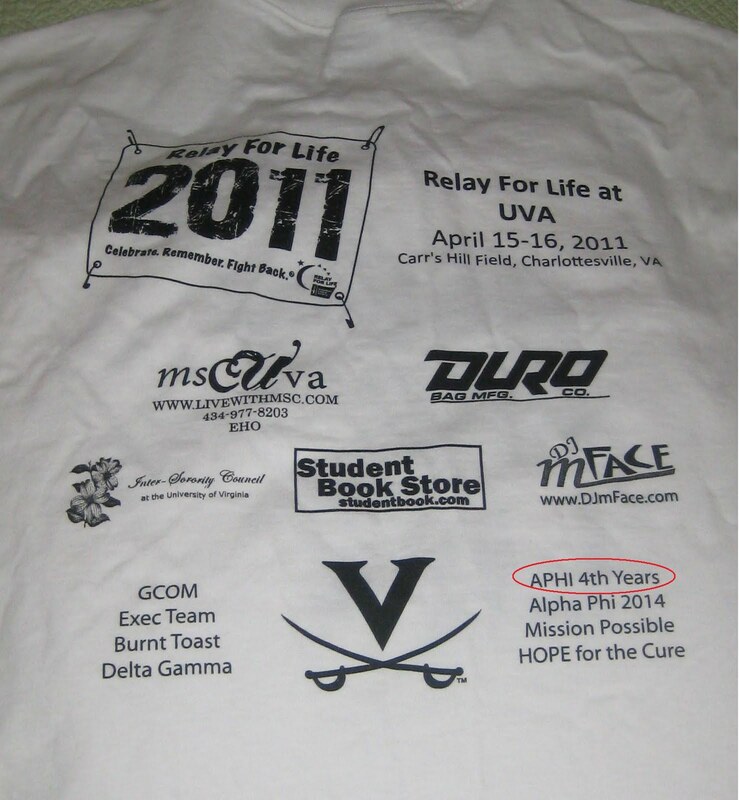 Our pledge class also raised enough money to be featured on the back of the tee shirt. Saturday morning I was supposed to participate in Cavaliers Care. Cavaliers Care is a day each year in the Spring when UVA students and alumni in Charlottesville and other major cities come together and do service projects all around their cities. Alpha Phi had a team this year, and I was pumped about our project. We were supposed to be participating in the 4th Annual Rivanna River Sojourn, canoeing down the river and collecting trash. Unfortunately, however, due to the weather, our trip was cancelled. Saturday we had storms all day and even a tornado warning! Though I was disappointed to not be able to participate, it freed up my day Saturday to get a project and other homework done. Sadly, our canoes stayed ashore. Saturday night was formal, and luckily the weather cleared up just in time! It was a bittersweet occasion as it was my last Alpha Phi date function. The night turned out to be very special. I got my dress at Monkee's, one of my favorite boutiques in Richmond. The weekend I bought it was their Anniversary Weekend. With every purchase that weekend, you got a free pair of earrings. I wasn't really expecting much out of this "free" pair of earrings, but surprisingly I loved them and actually was able to wear them with the dress! A group of fourth years had dinner at The Local before. I had never been to The Local, but had heard incredible things about it. They use all organic, locally grown ingredients in their cooking. As an appetizer I had the Truffled Mushroom Ragout Fettucine-- it was HEAVEN in my mouth. For my entrée I had Duck with Orange Sauce and Garlic Redskin Mashed Potatoes, which was also delicious! I took NGV as my date. He and I have been friends since first year and had a blast letting loose on the dance floor! I also ran into some old high school buddies, one of which I hadn't seen since senior year! Additionally, my favorite of our new first year pledge class is NMV. She is one of my residents and I really feel blessed to be her RA! On bid day she texted me saying: "We're sisters now!" and I couldn't be more thrilled to call her a sister. After formal I stopped by and visited my friend CMV who was the RA on coverage for the night. He and I had the most engaging conversation about religion, family, our life outlook, etc. We ended up staying awake until 6 AM talking! Though I was incredibly exhausted from it yesterday, it was well worth it and a great way to end an already fun night! Finally, Sunday we had an Alpha Phi 4th Year Wine Tasting at Cooper Vineyards. The vineyard is owned by Dr. Jeff Cooper whose daughter, LPC is my best friend in Alpha Phi. Cooper Vineyards is the first winery in Virginia to build a green tasting room. Last weekend, was the Grand Opening of the room and we were the first private tasting in it! My favorites of the tasting were the: Chardonnay 2008, Viognier 2009, Rhapsody, Soleil, Sweet Louisa, and Noche (chocolate infused!!). I opted to have a glass of the Sweet Louisa, which Dr. Cooper likes to refer to as "sassy grape juice!" Allie and Miss Cooper, herself! I finally got to wear my Wisteria Tunic! Group before heading back to Cville! If you're ever in Central Virginia and want to check out some of the local vineyards, Cooper Vineyards is a must visit! As you can see, it was quite the eventful weekend. I made so many great memories! You girls are soooo cute! You remind me of when I was in college. Love it! I assume you go to UVA? My son is a lacosse player and has high hopes to play there..wonderful school. Hope you are enjoying it! From the looks of it....you are...sounds like a fun weekend you had. Here, dinner parties, and a birthday party for a great friend...all great things. No complaints plus the sun was out! the new tunic looks good girl! Sounds like a great weekend! Looks like formal was so much fun! I have some really good friends in Alpha Phi. I also had formal Saturday night however the tornado warnings did not clear up. Imagine 20 girls in dresses sitting in the closet, haha. So glad the weather was better for yours! Looks like you had a great weekend! I miss formals so much, they were always great fun! Wow you had a great weekend! What fun! PS - LOVE Monkees. They do have pretty jewelry too so I'm glad you got good use out of the earrings! WOW! It made me tired just reading about your busy weekend! ha! JK! :) But it definitely makes me want to try out Cooper Vineyards! I'm only about 1.5hrs from Ch'ville! So much funnn!! You look gorgeous! We are so lucky we have so much fun stuff to do at UVA! You looked adorable for your date function! Your dress was perfect and I love your hair in that casual bun. So cute. It makes me miss my sorority days. Thanks for sharing! This looks like so much fun. You and your friends are gorgeous. And the weather looks amazing. Unfortunately, it rained in Eugene this weekend but it was mom's weekend for my sorority so my mom came down to Eugene, we did some wine tasting with my friends and their moms, did dinner and then a little shopping and brunch on sunday! Friday night, my boyfriend's parents were in Portland (they are from Denver) so my family had them over for dinner. A little nerve racking! My weekend also consisted of Virginia wine - the husband and I shared a bottle from Barboursville that we bought on our wine tasting trip in January 2010. Yum! Awww so many fun things! Totally reminds me of my sorority years! Loving the tunic too! You and your girlfriends are so adorable! i just found your blog (through Debbie at LoveOfTheSea) and you made me smile since I'm from Virginia too and my nephew is a junior at UVA. Looks like a great weekend! I'm a senior too and my last formal is in two weeks (time goes by WAY TOO fast!) I'm glad you had so much fun, the wine tasting looks so great, I want to do something like that with the 4th years in my sorority too! What a fun busy weekend! Ahhh...I had so much fun reading about your sorority and your formal! It makes me miss college. Enjoy everything, as much as you can, as long as you can! I LOVE The Local! Great food! I will def have to check out Cooper Vineyards, I will have to wait until after July 8 though! Since we both live in C-ville, we should try and meet up sometime! I love the top you wore to the vineyard. Where is it from? It's a perfect weekend top - i'm in love! Also - congrats on raising so much money for Relay for Life, that's a huge accomplishment and your sorority should be incredibly proud! What adorable photos - looks like such a fun weekend. And I love your dress - you look beautiful, my dear! i went grocery shopping and to the mall....your weekend wins! hah aand you look gorg!! You always have the best weekends! I bet wine tasting was so fun! Hope you have a wonderful week! What a great weekend! That looked like so much fun. That is so neat about the vineyard. The tunic looks adorable on you! I was an Alpha Phi many years ago. I must say we never did anything as classy as wine tasting! My best friends are still my sorority sisters.